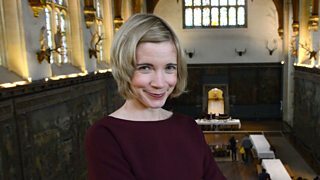 Historian and presenter Lucy Worsley is set to celebrate the 500th anniversary of one of the nation’s finest historical buildings, in BBC Two documentary Britain’s Tudor Treasure: A Night at Hampton Court. Here, she explores the building’s historical importance and intrigue, and discusses the fate of the infamous characters that passed between its walls. Back in October 2014, I spent a night in the sixteenth century. Along with more than 100 of my colleagues at Hampton Court Palace, where I work as a curator, we were recreating the christening ceremony for the baby Tudor prince, Edward VI. 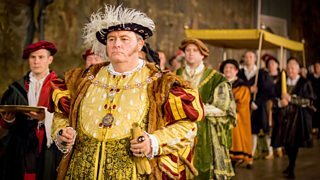 The event involved Tudor courtiers, dressed in their best, walking through the palace’s courtyards and galleries by the light of burning torches. Edward was the long-awaited male heir born to King Henry VIII and Queen Jane Seymour, and his complex and theatrical christening ceremony took place on 15th October, 1537. On this one amazing night, Hampton Court came back to life. Marvellous though the building is, it generally lacks its colourfully and elaborately dressed inhabitants, following intricate court rituals that were almost a huge piece of performance art. Jane, Henry VIII’s third wife, wasn’t present at her son’s christening, as ritual dictated she had to spend another month in bed. From her chamber she could have looked down on the christening procession below, and must have felt great pride. Doubtless she also felt relieved. She’d achieved the goal that had eluded her predecessors: she’d given the king a healthy baby boy. Henry had a habit of loving his wives sincerely, then slowly turning against them as they disappointed him. Only two weeks after giving birth, though, an infection would kill Jane. Henry’s betrothal to Jane in 1536 took place the very morning after the execution of his previous wife, Anne Boleyn. He was entering middle age, and the bright promise of his youth was wearing off. The sporting, handsome young prince who had been welcomed to the throne nearly thirty years previously was now acting in darker, more tyrannical ways. There was something desperate about the speed and the expense which he lavished on Hampton Court, building a new suite for the son he expected Jane to provide. Everyone called these rooms ‘The Prince’s’ even before the baby was born and its gender known. When he died in 1547, Henry chose to be buried alongside Jane, the wife he loved the most - because she left him before he had the chance to leave her. Hampton Court had been an occasional residence for Katherine of Aragon, at a time when it was still the home of Cardinal Wolsey, her husband’s chief minister. But Wolsey failed to get Henry the divorce from Katherine that he wanted after their repeated failure to conceive a son. When Wolsey fell from favour, Henry took the Cardinal’s palace away from him. Hampton Court was chosen for Henry’s honeymoon with Anne, and he had his builders throw up a new set of rooms for her. But she died before they could be completed. Ironically, the identical thing happened to Jane Seymour. All three of Henry’s first queens used the very same bedchamber. As soon as he was born, Edward was taken away from his mother Jane, and looked after by a staff including wet nurses and ‘rockers’ (to rock his cradle) in his own separate suite at Hampton Court. He grew up at the palace, which was considered to be a safe distance away from the plagues and dirt of the capital. But despite the care taken, tuberculosis would kill Edward at the age of only 15. Cardinal Wolsey lurks at Hampton Court like a spectre at a feast. A central character in Hilary Mantel’s Wolf Hall (played by Jonathan Pryce in the new BBC drama adaptation), the Cardinal had fallen from power and was dead by the time of Edward’s christening, but he was the one who began, from 1515, to transform Hampton Court from a farm into a magnificent palace fit for a bishop or a king. Much of what you see at Hampton Court today was his work, merely added to and embellished upon by Henry VIII. Lucy Worsley is a historian and presenter. Britain's Tudor Treasure: A Night at Hampton Court is on BBC Two and BBC Two HD on Saturday, 10 January at 9pm. Wolf Hall starts on BBC Two and BBC Two HD on Wednesday, 21 January at 9pm. Q&A with Susan Jebb: What's The Right Diet For You?